Summary: The Solar Breeze NX is the perfect surface skimming solution for pool owners who suffer with daily pool skimming chores. 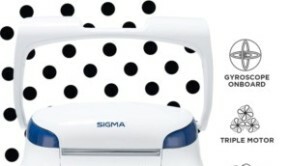 It can also dispense chemicals, and costs nothing to operate. 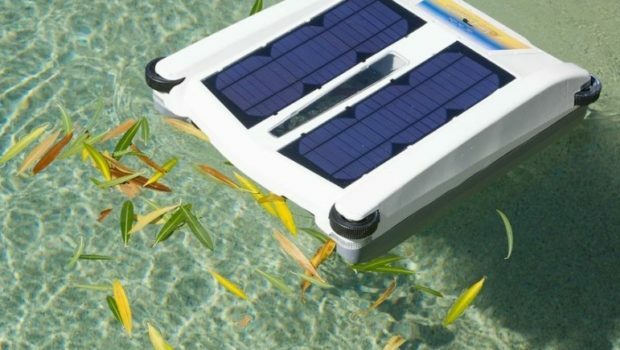 The only solar powered surface skimmer we know of. And it works great! Hand skimming a pool is a lot of work, especially if you have to do it often. Pools in dusty areas or near trees get dirty quickly, requiring skimming before every use. 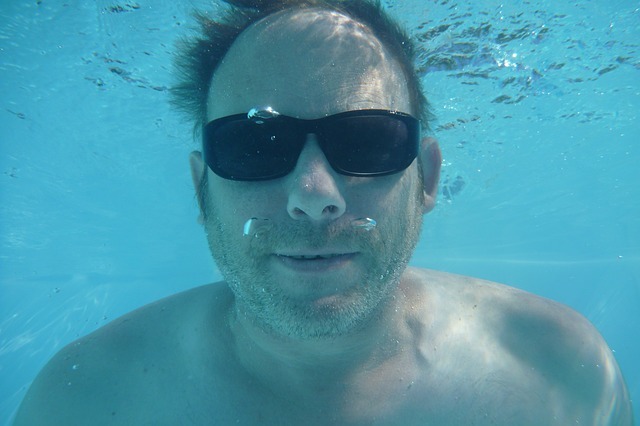 Frequent skimming is also important if your pool gets used a lot. Using the right mesh filter, a good skimmer can rid your pool of floating oil from suntan lotion. 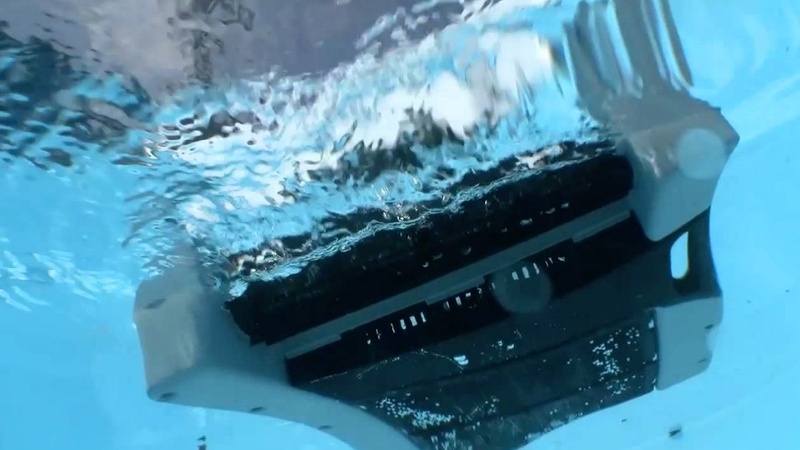 If you have the budget and suffer from constant skimming (like we do at my house), then the Solar Breeze NX Automatic Pool Skimmer is a dream come true. You just place it in the pool, turn it on, and it takes care of almost all of the debris & oils floating on the water. What is even more amazing is that it does this using 100% solar power – no cables, no electrical concerns, and no utility bills. And the solar charging works great – some users say they’ve never had to charge it from a wall outlet, since purchase. A constantly clean pool surface, with zero labor or power costs – what’s not to like? 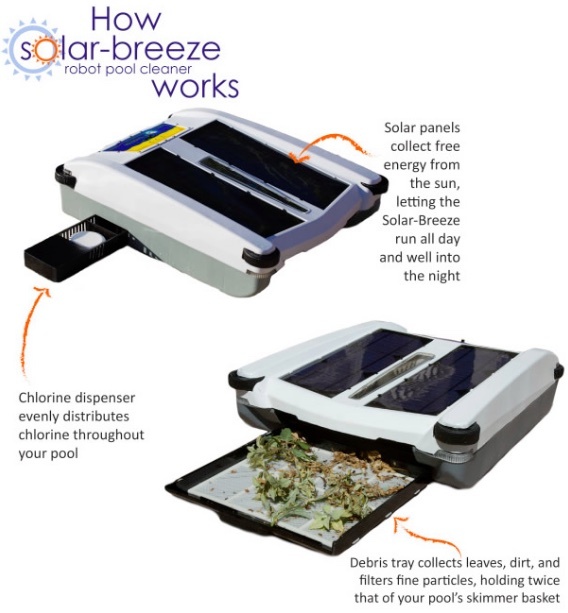 It is important to note that the Solar Breeze is just a pool skimmer, not a fully-fledged robotic pool cleaner. It just removes debris and unwanted particles from the surface of the water but does not clean floors or walls. 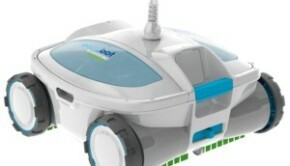 For that, you will need a robotic pool cleaner from brands like Aquabot and Maytronics. The Solar Breeze NX does what it is designed to do, efficiently and silently. Once placed on the water, it skims the surface collecting everything from leaves to pollen and even suntan oil. It does an excellent job, too. 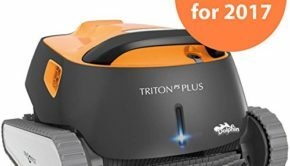 When it comes to ease of use, this is one of the simplest pool cleaners you will ever work with. Just place it in the water, turn it on and watch it go merrily on its way collecting everything unwanted on the water. It will collect twigs, leaves, pollen and other debris on the surface of the water. If your pool tends to develop floating films, the Solar Breeze skimmer can clean that up, too (for the most part). The Solar Breeze has solar panels on the top surface of the unit, which take in sunlight and convert it into usable electrical power. Batteries within the unit store the solar power and drive the motors. A paddle drive near the front moves the unit through the water and collects surface residue and debris into a collection tray, located inside the unit. The filter tray is removed periodically to empty it. 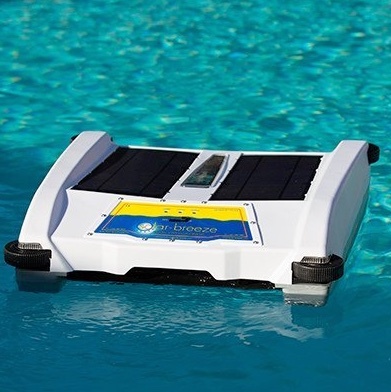 The skimmer comes with an intelligent onboard computer that helps in navigation, ensuring that every inch of your pool surface is covered. If the skimmer gets stuck, the computer will trigger an automatic reverse navigation to get the unit moving again. This is the best part about the Solar Breeze NX automatic pool skimmer, in my opinion. The best part about being solar-powered is the lack of a power cord. You do not have to connect it to a power source, unless you need to charge the batteries due to a lot of cloudy days. In addition to not having to pay for electricity, the absence of a cord means it moves freely without obstruction. 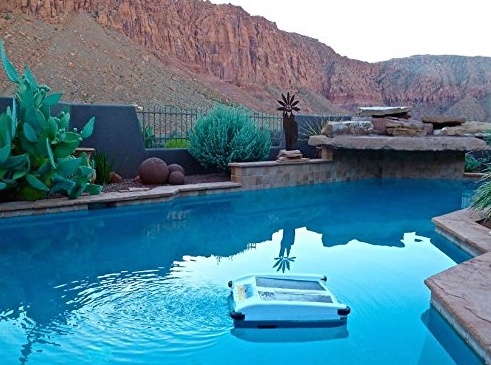 The skimmer can clean a pool of any shape and size with no issue. The Solar Breeze NX’s reliance on batteries has another advantage; you can use this skimmer a night. 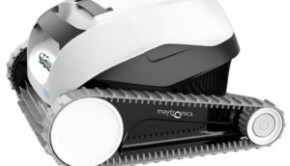 The batteries store enough charge to power the automatic cleaner for several hours without sunlight. When the battery charge dips below a certain level, the unit automatically shuts down and you will see a warning red light. Once you place it on the water, it does all the work on its own. This is due to its intelligent onboard processor that directs navigation and cleaning. The Solar Breeze NX is not just a pool cleaner; it can also be used to dispense pool chemicals using its built-in chemical dispenser. The advantage of using the Solar Breeze over other dedicated dispensers is that it spreads the chemicals more evenly across the pool leading to less wastage and cleaner water. No cords, no utility bill. By relying entirely on solar power, it eliminates any need to spend more on your monthly power bill. Suitable for above-ground and in ground pools of any shape and size. Built-in chemical dispenser takes care of yet another job. Some owners have noted that the unit may miss an area or two in larger pools. We didn’t experience this in our rounded/curved edge in-ground pool, however. 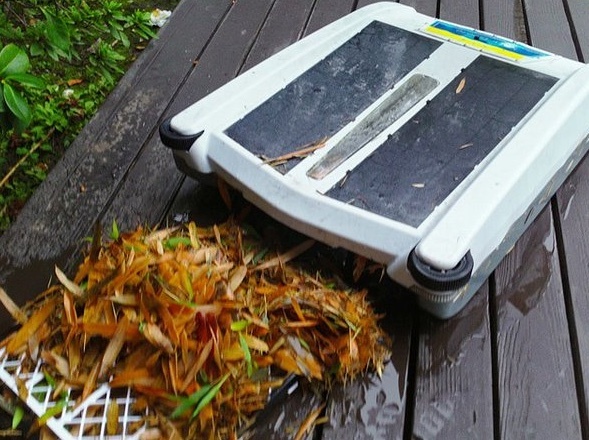 Many users caution that you have to be careful when lifting it out of the water, otherwise the debris may fall out. Adding handles for lifting would have been nice touch. Solar-operated: solar panels charge the onboard batteries which power the unit. Includes a chlorine dispenser for easier pool sanitization. Equipped with two 6-watt photovoltaic solar panels. Polycarbonate paddle wheels, one at the back for propulsion and one at the front to scoop up debris. High strength polyester filter mesh. If you can afford it, this is one product that every pool owner who suffers from daily skimming chores should have. The Solar Breeze NX makes the work of keeping the surface of your pool clean with zero effort on your part. Best of all, it costs you nothing to operate.